Acid etching the garage floor is sometimes the only viable alternative for many DIY home owners when prepping concrete correctly to accept a coating. It isn’t hard to do, but certain safety precautions and steps need to be taken to insure a successful and safe outcome. Potentially dangerous if not done correctly, it can not only damage your concrete, it can cause serious bodily harm as well. So please take the time to learn how to acid etch your garage floor or concrete safely before jumping into your project head first. Muriatic acid, also known as hydrochloric acid, is the typical acid of choice when etching concrete. It is inexpensive and a dangerous chemical that can damage almost anything it comes in contact with. It will eat through clothes, metal, skin, and creates a noxious vapor that can cause surrounding metals to rust as well as burn the lining in your nose and lungs. You can purchase it from your local home improvement center for less than $10 a gallon at a strength of 31.45%. Phosphoric acid which is a mineral acid works almost as well and isn’t as dangerous to work with, but it is harder to find and more expensive. It also works at emulsifying oils – something that muriatic acid will not do. Both will remove rust from your concrete. If you don’t like the idea of working with acid, you can read about some safer alternatives to acid etching here. Acid is generally mixed at a ratio of 3 parts water to 1 part acid for sufficient strength to etch properly. Ideally you want to test the strength needed first before doing the entire floor. You can do this by first mixing a small solution in your watering can starting at a 5:1 ratio. Apply it to a small area of wet concrete. It should begin bubbling and fizzing immediately. If not then you will want to increase the strength accordingly. Sometimes a ratio stronger than 3:1 may be needed for particularly dense concrete or a smooth power troweled floor. Caution! Always add acid to water, not water to acid. If you pour water into acid it can cause an explosive reaction that can spray you with the mixture and burn your skin! Before acid etching, make sure the garage floor is cleaned properly of all oil, contaminants, grease, and dirt. Contrary to what many people think, acid will not clean grease and oil spots. In fact, if these areas have not been cleaned and degreased properly, the acid solution will just sit on top and not react with the concrete. Use your hose to lightly spray down the concrete in your garage so that the concrete is wet but not puddling water. If you have a large garage floor, you may want to acid etch in sections. Do not let the concrete dry out before or during application of the acid solution. Use the 2 gallon plastic watering container to sprinkle the acid solution on the concrete. This will spread the solution evenly without much splashing. Do not just pour it on the concrete. This will create an inconsistent spread of the acid solution and will not provide for a uniform result. The 2 gallon container works well because you can mix 1.5 gallons of water to .5 gallons of acid for a 3:1 ratio. You can use any size you like, however, as long as you mix the ratio of acid to water correctly. 1 gallon of a 3:1 acid solution will cover approximately 50 – 70 square feet of garage floor. Once the solution is applied, lightly scrub it into the concrete with a push broom or long handled scrub brush. This helps to create a uniform etch of the concrete. Let the solution sit for 10 – 15 minutes while it continues to fizz and bubble. Do not let the floor dry out during this process. Add more solution if necessary. Mix 1 cup of baking soda to 1 gallon of water in your large 5 gallon bucket and pour it into the now empty watering container. Sprinkle your neutralizing solution over the part of garage floor that was acid etched and let it sit for a minimum of 10 minutes. When time is up, rinse the neutralized solution with your hose into a drain or out the garage (if local water codes allow it). Another method is to use a wet vac and then dispose of the solution according to your local codes. Check the surface of the concrete at this time. It should feel similar to medium grit sand paper with a uniform texture. If not, you will need to repeat the process again. Once the initial neutralizing solution is cleaned up, it is important to thoroughly flush and rinse the remaining solution out of the concrete multiple times. It can leave a white powdery residue (calcium carbonate) on your garage floor once dried if you do not do this. This is a fine white dust that will not allow your coating to adhere properly. 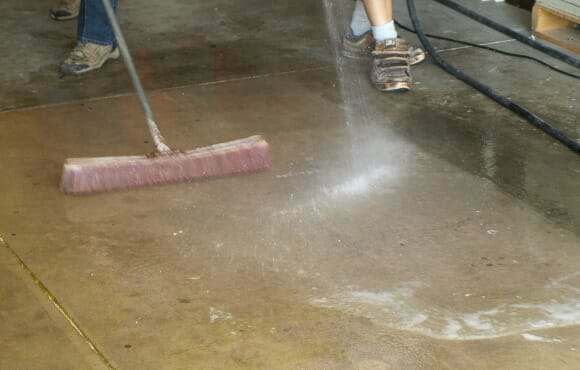 Use a high pressure nozzle while thoroughly scrubbing the concrete with your scrub brush. You can introduce a mild solution of Simple Green at this point if you like. Just make sure it is thoroughly rinsed. Using a pressure washer for this process well also. Do not use a pressure washer to rinse off the initial neutralizing solution however. It can drive any acid solution that had not been neutralized deeper into the concrete and cause problems later. After your final rinse, dab a pH test strip onto the still wet garage floor to check the pH. Anything between 6.0 and 9.0 will work for most coatings with 7.0 (neutral) being ideal. If it’s below 6.0 then the water is indicating that acid residue is still in the pores of the concrete. Rinse some more and repeat the test until you get the results you want. It’s a good idea to cover anything in your garage that you don’t want to get splashed with a plastic drop cloth. Another recommendation is to mix some neutralizing solution up ahead of time and spread it out liberally on your driveway. That way any acid solution that is hosed out will not mildly etch or discolor your driveway. Don’t acid etch the concrete if the temps are below 50 degrees as the acid will not be as effective with the cooler temperatures. Also, make sure your garage floor has dried thoroughly before applying epoxy coatings. Fans will help. Give it at least two days with warm weather and longer if it’s humid or cooler. Though the surface may be dry, the pores of the concrete can still contain moisture and escape through outgassing when the temperatures rise during the day. This will cause your coating to form bubbles. You can always do a quick moisture test with plastic if you are not sure. Learning how to acid etch your garage floor isn’t hard, but it’s very important to follow the proper steps. When done correctly, the chances of having your coating fail due to improper preparation of the concrete is reduced significantly. I am looking to eliminate heavy dog urine odor from the garage floor. I have attempted to eliminate the odor by heavily utilizing enzymatic cleaners and 50% dilute bleach solutions to no avail. From my research, at this point, I believe that sealing the concrete is the best solution. I would greatly appreciate any advice on the proper steps that should be taken from here. From my basic understanding, I will need to clean the garage floor the best I can (there are currently some black and white-ish discolorations and stains), then etch the concrete with 1-10 or 1-5 ratio muriatic acid solution for 10-15min, neutralize the acid with a dilute solution of baking soda & water, rinse and allow to dry. Once prepped, I was thinking of applying 1-2 coats of Kilz Max water-based primer (due to concrete surface), allow ample time to dry, then applying 1-2 coats of KILZ 1-PART EPOXY ACRYLIC CONCRETE & GARAGE FLOOR PAINT over top. My questions were 1) is it okay to apply the water-based primer on a garage floor 2) is it okay to apply a 1-part epoxy acrylic over a water-based primer 3) am I completely off the mark in terms of what I should be doing to seal the garage floor with the aim to seal the odor? I greatly appreciate any assistance in advance! Hello Yuta. We actually have an article that discusses how to get rid of urine smells in concrete. You can read it here. The Kilz primer and 1-part epoxy paint are the wrong products to use. It’s a latex acrylic paint with epoxy resin added. Such a paint breathes and will allow odor molecules from within the concrete to escape through the paint. What you need to use is a true 2-part epoxy coating and not paint. Epoxy coatings do not breath and will seal the concrete. This prevents the odor molecules or anything else from permeating through the coating. Thank you so much for your response! I have read through the other pet urine elimination and epoxy application articles and found them to be very insightful. With regards to a “true” 2-part epoxy coating, will a 2-part epoxy water-based coating, such as the Rust-oleum epoxyshield be sufficient for preventing permeation of the odor molecules? Or will it absolutely need to be a 100% solids formulation? Ultimately, my only goal really is to seal the odor with a long-lasting solution for as minimal a cost as I can manage. I read your article on exactly this question regarding the bad rap of epoxy paint kits, and noticed the Rust-Oleum Professional kit which seems to ride in the middle between cost and quality. Based on your experience, do you believe this product may be enough to sufficiently contain the odor? I really appreciate your assistance with this matter! You are welcome, Yuta. No, it does not have to be a 100% solids epoxy. As long as it’s a resinous coating and not paint, it will do a good job of blocking the odor. The Rust-Oleum Professional EpoxyShield would be sufficient and provide a better value over the less expensive water-based version. Any recommendations for completing a garage that slopes to a paver driveway? Do I need to wet vac the garage to protect the pavers? Will neutralizing the pavers work alone? Combo of wet vac and paver neutralizing? Hi Sarah. Sometimes decorative driveways can create a bit of an obstacle, but with the proper precautions you can avoid any issues. The amount of the acid solution should not be so much that it is running out the garage. It just needs to get the surface wet and remain wet while it does it’s job. That said, you can put up a small sand damn immediately in front of your pavers. It will hold back any acid solution that may want to run out and allow you to properly apply the neutralizing solution as well. We recommend a heavier application of the neutralizing solution. The reason for a heavier application is that it will allow you time to wet vac the floor. Neutralized rinse water will have a fine white powder (calcium carbonate) in it as a result of the etching. If you rinse that out the door it can get caught up in the large open pores of the pavers. The wet vac with the proper attachment should pic most of the white powder up. Once you do that, you can break down one small side of your sand damn and rinse the rest of the floor out through that. That will direct most of the rinse water away from the pavers (hopefully). This rinse water will have been properly neutralized and there is no worry of it discoloring the pavers. It is very important not to let any of your concrete dry at all during the entire process or you will end up with the white powder (calcium carbonate) on the surface of the concrete and that takes some scrubbing to remove. If you need to wet the concrete with fresh water behind you as you wet vac that is OK.
“Do as you oughtta, add acid to wautta” Safety slogan in public high school, 1960’s I still remember it! I have to say that we haven’t heard that one before. It’s good though!